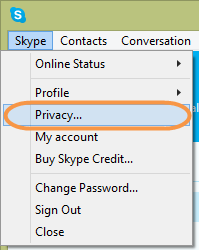 Skype’s privacy settings let you control who can contact you on Skype, and help you manage your conversation history. You can change your privacy settings to prevent nuisance calls or spam messages, as well as block and report any nuisance contacts. Learn more about your online privacy and security. When you first download Skype, by default only the people in your contact list can see your profile picture, or share their screen or video with you, but anyone who searches for you can call you or send you an IM. You can change these settings at any time. The Privacy Settings panel is displayed. Control who is allowed to make Skype-to-Skype calls to you. Under Privacy settings, choose Anyone or people in my Contact list only. Control who is allowed to send you video and share their screen with you. Under Automatically receive video share screens with (just below the Allow calls from area), choose anyone, people in my Contact list only, or no one. Control who can send you instant messages. Under Allow IMs from (below the Automatically receive video share screens with area), choose anyone or people in my Contact list only. 5 Check the Allow Microsoft targeted ads, including use of Skype profile and gender option if you want to share your profile details with advertisers. Learn more about who can see your profile information. Check Remove from your Contact list. To report a nuisance contact to Skype, check Report abuse. Click Block. The contact is removed from your contact list and won’t be able to contact you again. 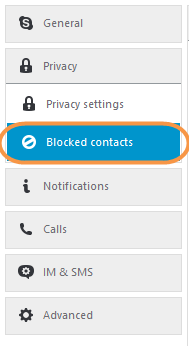 In the Blocked people box, click the contact you want to unblock and click Unblock this person. The contact is added back to your contact list and can contact you. Learn more about managing your contacts in Skype for Windows desktop. To learn more about your online security, safety and privacy, visit our security center.